dates – 15th dec, 22nd dec, 05th jan & 12th jan.
costs – A & B grade teams $400 (series fee). 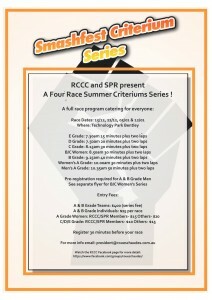 A & B grade individuals $25 per race. 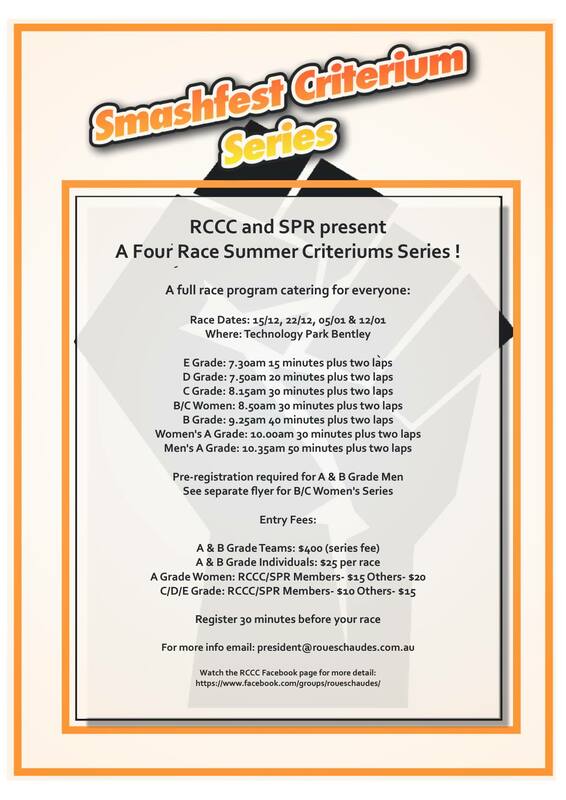 A grade women $20 per race ($15 for spr/rccc members). C/D/E grade $15 (spr/rccc members $10) – no prize money. registrations close 30min before each race. for non-ca licence holders – a single race day licence is $33, while a 3-race licence is available for $44. either of these will be required to ensure that not only you, but the people racing around you are covered in the unfortunate event of an accident. a separate women’s series will be held for ‘a’ and ‘b’ grade women. points will be awarded as above, but based on their position as compared to other women in that race. results, series leaders and finishline video will be published on this site after each race. for those of you who like to warm up on wind trainers, the building owners on the inside of the circuit have asked that you not use your wind trainers on their veranda as you are leaving a black residue on their paver’s and walls.